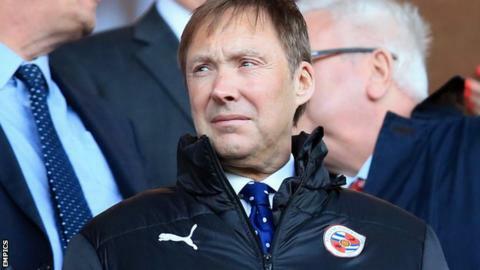 Reading chief executive Nigel Howe says Steve Clarke will be judged by the club's board and owners on results. Clarke turned down an approach to join Championship rivals Fulham after being given permission to talk to the club. The former West Bromwich Albion manager admitted he "wasn't close" to leaving the job he started last December to replace Kit Symons at Craven Cottage. "Steve can only show his worth to the club now by being successful on the pitch," Howe told BBC Sport. "This is one of the best squads the club has had for as I long as I can remember. They're capable of doing good things. "The decision has been made by Steve to stay, in an open and professional way. I'm only going to be judging Steve against his results." Howe admitted the club gave Clarke the chance to speak to Fulham after learning lessons from refusing to allow Alan Pardew to talk with West Ham before his departure in 2003. "It got to a point where Alan was going to go if it was any offer from any club. He was so disenfranchised in the way he had been dealt with. "In Steve's case, he told me he wanted to have a conversation with Fulham. My initial reaction was I needed a quick answer and it was a matter of a few hours and he decided he wanted to stay. "You're better off letting people have that conversation," he said. Howe admitted Reading's consortium of Thai owners were also happy with the arrangement. "Initially, they had to get their heads around how it works in British football," he added. "They're extremely with his decision and hope he'll get on with the job of delivering success for the football club."